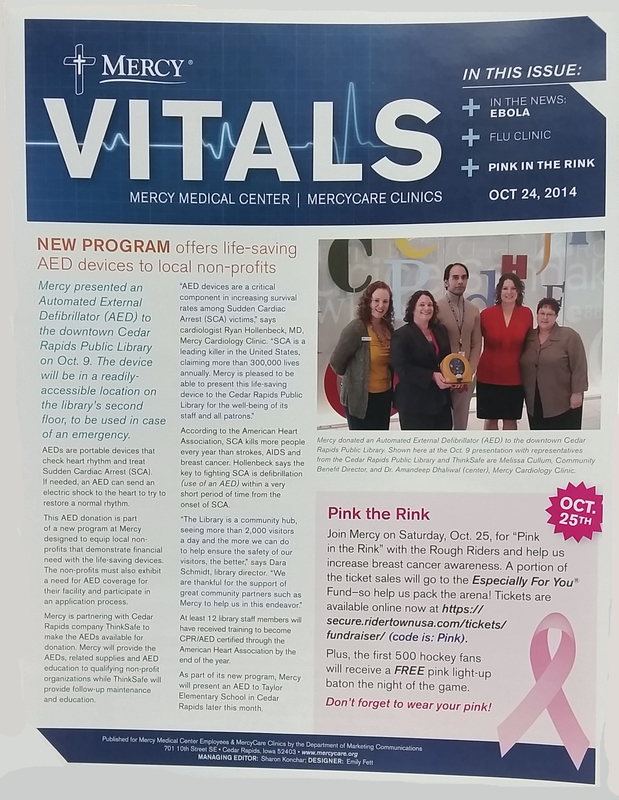 Mercy Medical Center, in Cedar Rapids, Iowa presented an Automated External Defibrillator (AED) to the downtown Cedar Rapids Public Library on October 9, 2014. The device will be in a readily-accessible location on the library’s second floor, to be used in case of an emergency. The AED donation is part of a new program at Mercy designed to equip local non-profits that demonstrate financial need with the life-saving devices. The non-profits must also exhibit a need for AED coverage for their facility and participate in an application process. Mercy is partnering with Cedar Rapids company, Think Safe to make the AEDs available for donation. Mercy will provide the AEDs, related supplies and AED education to qualifying non-profit organizations while Think Safe will provide follow-up maintenance and education. As part of this new program, Mercy will present an AED to Taylor Elementary School in Cedar Rapids later this month. **As part of this program, Mercy Medical Center and Think Safe also presented an AED to Taylor Elementary School in Cedar Rapids later in October. For more information about AEDs and purchasing options, please complete the following form, and we will promptly contact you! You are currently browsing the Think Safe Blog blog archives for November, 2014.